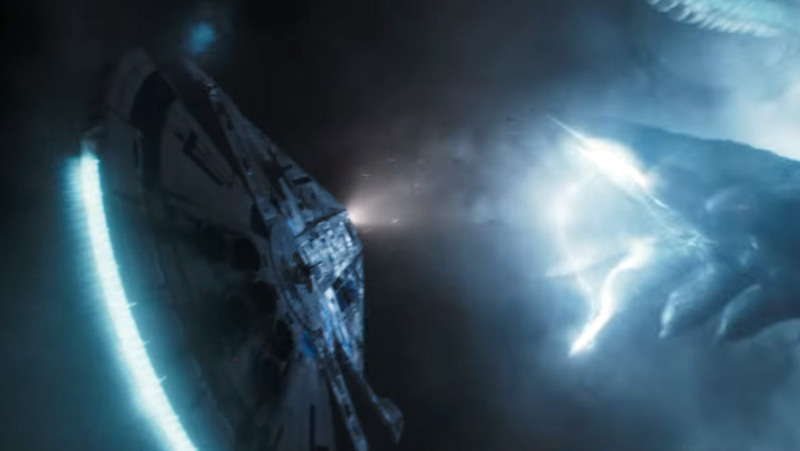 I have been to the latest SW sermon on the mount known as Solo: A Star Wars Story. Now, I’m ready to tell you all (spoiler-free of course). 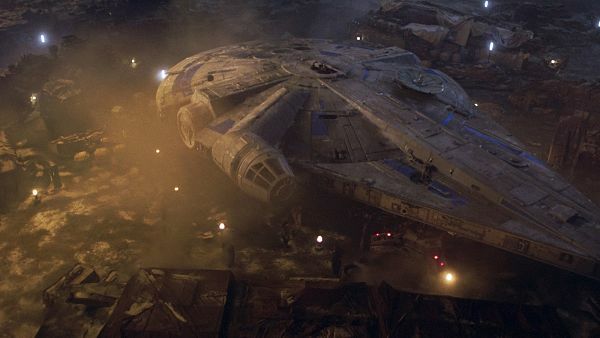 The major thing that makes Han Solo such a beloved character is that not only is he proud of being a snarky a-hole, he’s a proud, snarky, CHARISMATIC a-hole that’ll rob you blind and still call you “friend,” much like he does with Lando Calrissian. In a role like Han Solo, the old adage “Timing is EVERYTHING,” really does apply here. While Ehrenreich has the swagger, his comic timing is a tad off; making jokes that should be funny fall sadly flat. 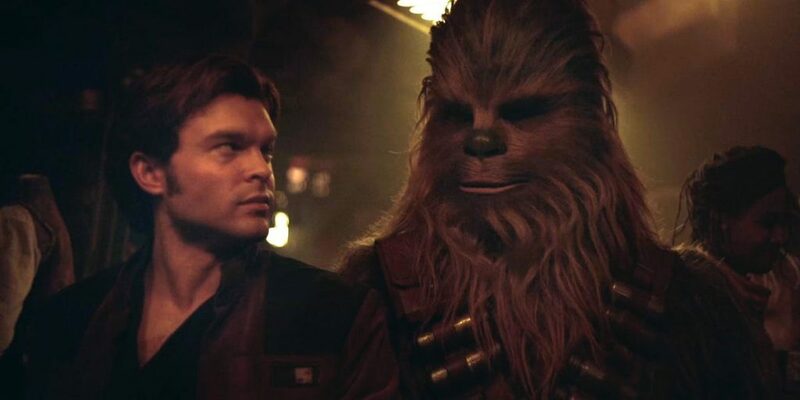 Ehrenreich seems to find footing once Chewbacca (lovingly played by Joonas Suotamo) enters the story, but even then I’m left waiting for Ehrenreich to do one simple thing: RELAX. 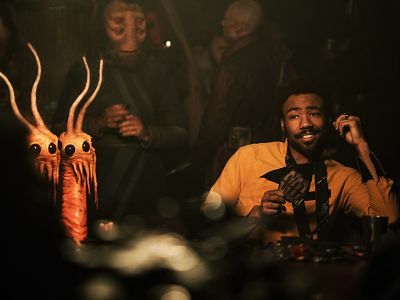 The thing about scoundrels like Solo and Lando is that they always look incredibly relaxed on the outside, even if they’re pooping their pants from fear on the inside. 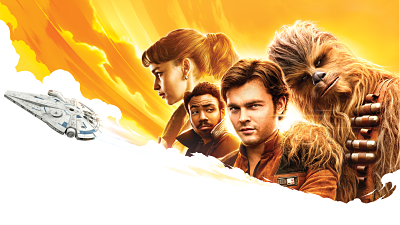 I’m sure you’ve heard how great Donald Glover is as Lando. 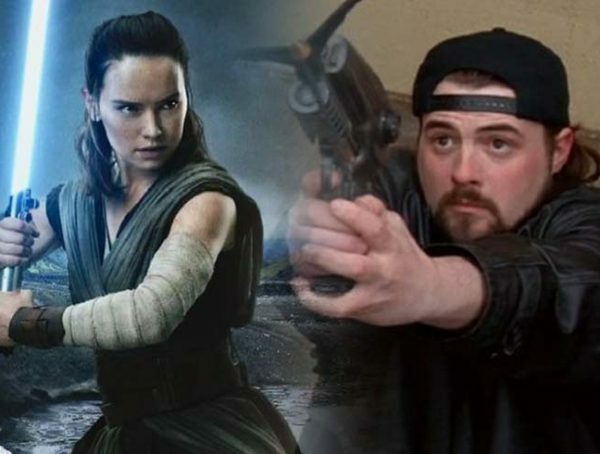 I felt like he channeled every bitty bit of Billy Dee Williams circa “Colt 45-Star Wars” while also making the role his own, so I’m going to move on. But seriously, Donald Glover is pretty dang awesome as Lando and his capes are to DIE for. 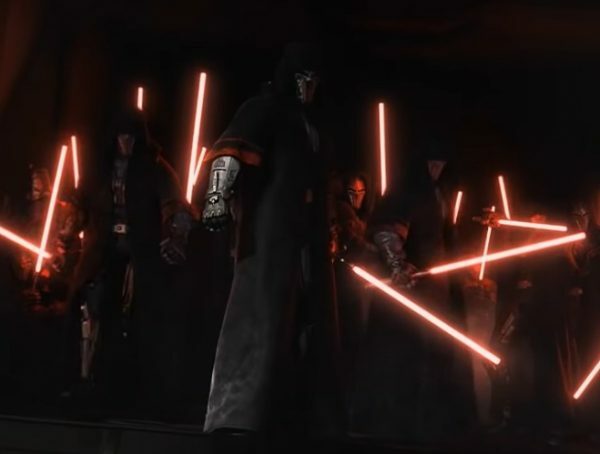 Speaking of capes, let’s talk Dryden Vos. Not only does Vos have zero qualms about killing anyone who crosses him, he has a killer wardrobe (LIVING for his fishtail capes) to match. Paul Bettany has a seamless ability to switch from deliciously charming to devastatingly evil in a matter of seconds; fans who’ve never seen Bettany play anything other than J.A.R.V.I.S./Vision are in for a big surprise. 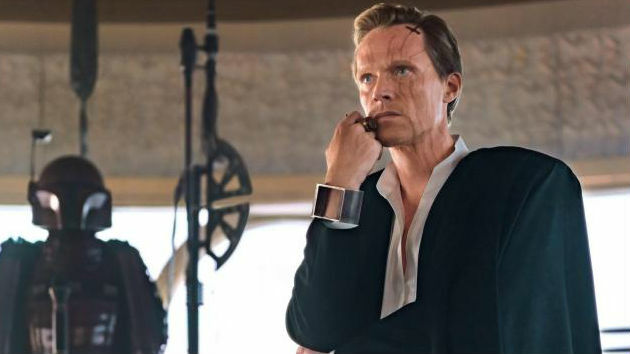 I’m a forever fan of this guy, so seeing him in a Star Wars film made me giddy. I can’t say much about Emilia Clarke as Qi’ra because if I do, I’ll ruin it. 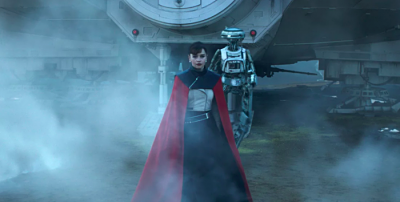 Qi’ra has reason and purpose that doesn’t feel forced or make her out to be a “brunette Khaleesi” while holding her own against the men. Another notable standout is L3-37, played to hilarious perfection by British actress Phoebe Waller-Bridge. A lot of folks are mistaking her for that of Gwendoline Christie (aka Captain Phasma), but if you want to see what she’s about, she has two shows stateside: CrasHing (Hulu) and Fleabag (Amazon). 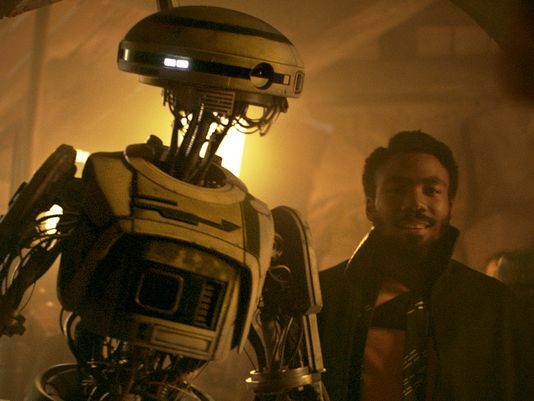 L3-37 is such a great name for her because not only is L3 Lando’s ride or die, she is an amazingly WOKE droid with a swivel to her walk that made me jealous. Waller-Bridge brings a wonderfully comic civility to the role and where C-3P0 was full of “I beg your pardon,” L3 is “MOVE or I’ll move you,” which I LOVE. 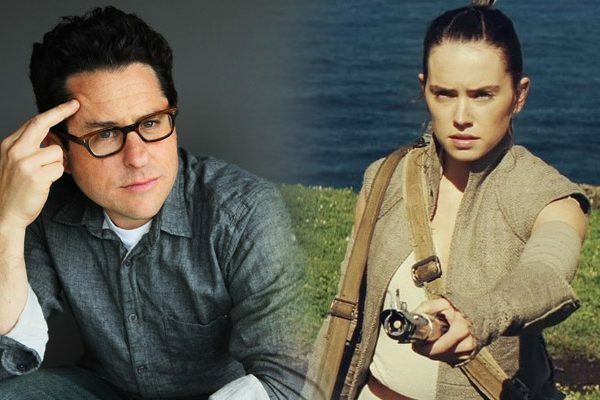 Her delivery is effortless and identifiable to anyone who’s had to fight for their place, kind of a first for the droids of the SW film universe. She may be a bucket of bolts, but she, much like her name, is truly elite. Despite a number of misfires, Ron Howard stepped up to tell the world how a rogue bandit became one of the most beloved characters outside of the Skywalker clan. And while Howard is the first Oscar winner to direct a Star Wars movie, it still lacked something. The action scenes are incredible but I found myself wishing for more and disappointed with the way some of them ended. My friend and I found ourselves throwing our hands up in the air out of exasperation because we couldn’t believe how many “that just happened” moments were coming at us. The “this is how Han got THIS” moments were a little heavy handed but nonetheless amusing enough to get a chuckle out of the crowd. If I was putting peepers on this magnificent beast for the first time, I’d say “WOW” a lot, too. And with that, I gently reminded myself that while the film was made with fans like me in mind, it’s really for the NEXT generation of Star Wars fans to know and love the world I’ve known and loved for the last 40 years. And that’s NEVER a bad thing! Did I love the movie? No. Did I like the movie? Absolutely. It just needed a little more. Love Star Wars? Be sure to check out HumanlyAwesome.com for some awesome merch!